For a while last year I toyed with the idea of wearing an abaya but in the end I decided against it. Obviously, in Saudi Arabia pretty much all the women wear abayas or jilbabs of some sort so I was wearing a black abaya and black shayla for 3 weeks on our recent trip to umrah - boy was that hard! I have been to Saudi Arabia for 5 or 6 weeks at a time before but never did I miss my wardrobe so much! I have to say kudos to you young ladies who give up your 'normal' clothing to wear the jilbab/abaya full time outside of the house because it must be bloody hard. I have never really thought about it before but I genuinely hope that every Muslimah living in the west who decides to wear an abaya for the pure sake of pleasing Allah (SWT) receives abundant rewards in this life and the next. Seriously, I have a new found respect for abaya-wearers for not conforming and putting their religion and desire for modesty first. I know people who say that what you wear does not reflect your religiosity and I kind of agree; what I will say though is that to wear an abaya/jilbab every single day requires serious jihad al nafs (" jihad of the self") that deserves so much more reward than a girl like me who just dresses modestly with a headscarf. Allahu a'lem. I do wear 3abaya full time alhamdulillah. Sometimes it is a struggle but there are ways to make 3abaya a little unique and really it is much easier to wear than all of the matching you have to do to wear "western" clothes lol. I wear abayas all the time too and was wondering what you found difficult? I agree with NeverEver, it's easy to pick what to wear cause it's an abaya and scarf and you're good. It's only hard for me when I cannot find anything that I want to wear. I have abayas and long dresses in my wardrobes. Due to my size and pickiness, I sew my own clothes. My mentality about abayas is I spent time/money on this dress + plus I like it so I'm going to wear it. i wear abaya fulltime and i gotta say it is really not hard at all. AT ALL. not even one tiny bit - i dont even think about it. it is only hard if it is an obstacle to you or if you dont feel comfortable with it. im 100% ok with wearing it so it is the easiest thing for me to wear. the way i see it - non-muslims are going to look at you on the streets anyway and see you as different because of your headscarf, whether you are in abaya or jeans. we are all the same to them. and at the end of the day, if you dont give an eff what other people think then you can wear anything and not be bothered by other ppl - hence it wont be hard for you. The point that I'm getting at isn't about what you wear with an abaya - it's about what you don't wear with it! I personally love putting outfits together and I would find it hard to have to limit myself to an abaya all of the time. I'm not talking about what people think I'm pointing out that it must be difficult to not be able normal clothes now and again. i started wearing abayas full time recently and i also don't find it tiniest bit difficult. actually i think it's much easier than 'normal' clothing. i custom tailored 2 coloured abayas and bought 1 black one in Dubai. they all have batwing sleeves (i took a dubai one as a sample for other two). one is dark brown body+patterned sleeved and other one is violet body and floral sleeves (good for special occasions/fancy evening etc). i LOVE them. i want to buy/sew couple more so i can switch them and not get bored. plus now i can buy pretty clothes with no restrictions to wear underneath :) and there's still room for accessorizing: scarf, bag, shoes, jewelry.. I found it easier to wear, but then, I was always a dress girl before Islam. Dress, bag, shoes, necklace, earrings, hairaccessory. After Islam: abaya, bag, ring, shoes, cool hijab accessory, maybe even a long necklace or earrings, awesome hijab or shayla. Was same as normal clothes to me. I was never a "pants" girl when I wanted to be stylish. I'm on the same page as Omani Princess, I still accessorize plenty and find abayas easy and flattering for me. You never tell us why you had trouble wearing abayas. Pls share if you can. Also, "jihad al nafs" is also referred to as the "greater jihad", right? Anon: It is indeed called the "greater jihad". Well it's superficial really but I missed my normal clothes! I like wearing a variety of things and would find it difficult to stick to the same type of clothing everyday. I really don't know how some girls do it, I think it's pretty amazing for someone to do that their whole life just for the pleasure of Allah (SWT). I'm now beginning to think that they all think it's easy because He (SWT) has made it easy for them. Salam. How is wearing an abaya more preferable to loose shirts over loose pants or a skirt? I'm pretty sure the Qur'an says nothing about wearing an abaya. It's not just you!!! I TOTALLY get where you are coming from. I love finding all of the matching pieces for my outfits. This is actually a love that has grown since becoming Muslim...before it was a shirt with pants or a skirt with NO layering. I was absolutely anti-layering. Now I love finding a matching cardigan and shayla that will make the outfit pop just that little bit, you know... :/ I would hate to wear the same thing every day. Although I do enjoy wearing abayas occasionally and think they can look rather elegant. Anon: Where did I say it was preferable in Islam? I said it is HARDER to wear than loose shirts. If you read this blog you will realise that I don't think the abaya is required at all. Why choose to wear the abaya? If a loose shirt is just as appropriate, why wear something more difficult and attention attracting? Anon: Fair point. I don't know, some people say that it is required to wear in Islam. smh @ this. "A loose shirt is just as appropriate?" REALLY?? Anon: LOL! I had to Google "smh". I take it you're pro-abaya then? Christian as I am, I would never wear an abaya, but I do admire muslim women who express their faith in such a devoted way. I am also a full time abaya wearer. It's nothing difficult and the abaya is really a versatile attire that can fit any majlis/situation. Even though Malaysia is quite hot, I'm still comfortable wearing the abaya outside. Just need to know the suitable material. Other Anon: In your opinion, why isn't a loose, knee length shirt over wide leg jeans just as appropriate as an abaya? 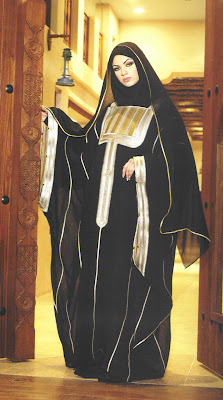 i am also want try Abaya..and want to have one..but i dont know where to find it. i somethimes used to want to swap it for a long skirt or a maxi, but then i would feel like i had the word hypocrite printed accross my forehead! slowly i began to realise the effect it had on me, i felt it was inappropraite for me- a full time hijabee- to talk to guys and to stay out late with a bunch of friends. i realised the respect i got, and i loved it. not long after, in feb this year, i decided to wear the niqaab. i have never felt more freedom in my life before. well, I dont think wearing an overgarment all the time when leaving the house is hard...you do get used too it, you may eventually progress to it...y'know...Though I try not to wear black abayaat allll the time, I do try to wear sometimes like colored abayaat and colored jilbabs (Turkish style or Syrian style)...really its not hard, and I think they look very nice and elegant...cuz you look simple and put together and you can wear whatever sort of scarf you want...really its not hard. In Saudii always wearing black got on my nerves,...but I like how here in the US if I wanna wear a turquouise abaya or a green jilbabs I can do that. You might find it hard because serriously, living in the West one does lack stylish jilbab options (OR COMFORTABLE ONES, as most manufacturers use crummy quality fabrics or charge a fortune). All are basically the same cut, or ugly, and limited for colours, unless you have a tremendous budget. That is the one thing that limits, beyond living in a place where the Muslim community frowns on styles or being different (in my village, for example, wearing the latest fashions in abayas is frowned upon but everybody does it in the city lol, and like in KSA, everyone has to wear black ect). Ramadhan Mubarak, I've been reading (and enjoying) your blog for a while. I liked this post because it made me think, huh, I never thought of it that way. I wear abaya full-time and I kind of like it, cause I feel like I look unique, and stand out from the crowd. Also it's a challenge to make an abaya look fashionable, stylish and individual, and I guess I like the challenge. But I know what you mean about wanting to wear CLOTHES! I have friends who are as practicing as me, but don't want to wear abaya because they love buying clothes and coming up with coordinating outfits for very stylish and modest looks. I have to yet start wearing head scarf. And those who are most pious and careful in trying to please ALLAH (SWT), they will be blessed and are better in this deed than people like me. BTW i totally think, its very important that once we decide to cover our head, its more important that at same time, our dresses do not showcase our curves. Also the headscarves should not be heavily embellished alongwith very painted faces. As it compltely negates the true spirit of veiling or modesty. And i see it everywhere that girls are wearing scarves but have no clue about rest of thier dress up. Wearing an Abaya is obligatory upon every Muslimah... It was revealed in the Quran that the women must wear a Cloak when we are out in public. While it may be difficult for you to do, it is not a choice. May Allah give you ease in that which is difficult for you, Ameen. As Salaamu alaiki, just came across your post and I'd drop a few words. P.S. That feeling of missing your colorful everyday garments may just as well be whisperings of the Shaytaan to discourage you. May Allaah ta'ala protect us from him. In Summer you can make(or have made) a cotton abaya as cotton is very breatheable & loose clothing helps fight the heat inshaa Allaah. Dressing with hijab is a choice just like any other deed. Once you know what you have to do and how important it is, then inshaa Allaah, you don't have to worry about who's pious or not ,or what others think of you. Just because you don't wear hijab now doesn't mean you shouldn't, as Allaah commanded all the believing women to wear it. i actually like wearing the abaya, i usually just chuck it on if im dropping into the shops to pick up milk etc or if im going to a ladies party and have something nice on underneath;) and sometimes to muslim events wen i feel like my normal wadrobe would attract extra attention lol and make me look out of place!! my dearest sisters, i'm sameera and i'm from sri lanka. i came accross your blog accidentally and read all about your comments. i would like to add some information regarding the awrath which means must of wearing a dress. these are the requirments of hijab. 1. it shouldn't be see through. 3.other than areas bellow your wrist, and face, you should cover your entire body. 4. it should't be attracting people towards you. i.e general idea is your beauty shouln't be revealed to ajmnabes'. you should wear a polite dress even its your own family. because shaitan has challenged Allah subhanahutha-ala that he will mislead his umma and he will fill the jahannam with them. as the sister stylish muslima said it is a jihad agains your nafs. i'm wearing an abaya since i was 16 years old. i accepted it by my will and most of the moslim ladies in sri lanka are the same. i'm really sorry to write an essay here :D but my beloved sisters don;t led=t shaitan win his challenge. and show him we didn't forget the promise to our lord in A-alamul arva where we were just roohs. May all your good deeds be accepted by allah. may we help our brothers and sisters who are in any difficulty, may Allah guide us through this very little tie of life. wear hijab because we Muslim women are expensive (thanks to mbk elsa in Yellow up ur live which gave an understanding about hijab), I wear hijab since I was in high school, and I'm very comfortable with that until now and later. To wear Arbaya, u have to sacrifice..I do wish to wear it but in my country environment..guess little bit hard & yeaaa its like I am jihad towards myself. While I respect women who do this as well, I think there's a drawback: people could think you're "oppressed" or that Islam is something too foreign for them to consider. It's much easier to wear hijab and still seem "modern"/free, which makes it more likely for non-Muslims to accept it (in my opinion). wearing abaya is so comfortable and still you can be as stylish as you wish, it will be more stylish in the black cloak compare to other dress. Its not a burden wearing an Abaya, if someone really has fear for Allah then i cannot see where is the problem. Their is no obedience in disobedience of ALLAH. I have a question, if I decide to wear an abaya do I have to wear it full time? Is this a full commitment? I've thought about wearing it and I just wanted to know can I wear it se days and some days not! A blog: Not at all, you can do whatever you like!